Haycomp, is a speciality manufacturer with over 20 years’ experience in the design & manufacturing of Patient Lifters & Walkers for Hospitals, AgedCare & Rehabilitation Facilities. After achieving the European & American Patent we now wish to introduce the Eagle Passenger Lifter (Eagle2Lifter) & Hawk Stretcher Trolley to the International Aviation market. 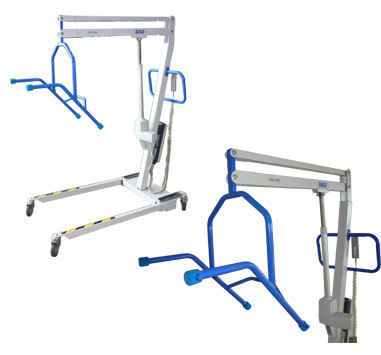 With over 300 units already sold worldwide the Eagle Passenger Lifter (Eagle2Lifter) is providing PRM’s and Service Providers the “CHOICE” between manual handling and an Eagle transfer! The question is not about manual handling verses Eagle Passenger Lifter, it’s about providing passengers & service providers a CHOICE! PRM’s are in the best position to advise their individual needs! Service Providers should also have the right to refuse the manual transfer of passengers in excess of 100Kgs, this is a risk for the passenger and the Health & Safety of the provider. So, when is manual handling deemed inappropriate? 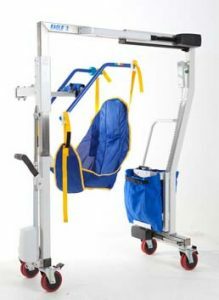 The Eagle 1 Passenger Lifter is designed to lift passengers from their own wheelchair into an airport wheelchair or aisle chair, thus avoiding manual handling. Departures: If time is limited this provides the service provider more time to take the passengers wheelchair down for loading into the aircraft. Arrivals: At some airports the PRM’s wheelchair (if in excess of 120Kgs) is required to be collected from the baggage claim area. 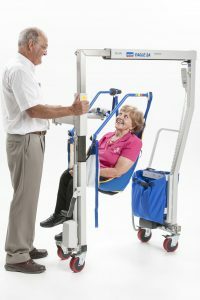 This technique in conjunction with the Eagle Passenger Lifter allows for passengers to be transferred safely to the baggage claim area to collect their wheelchair. The Eagle 2 Passenger Lifter (Eagle2Lifter) is designed for mainline commercial jets with 3 seats each side of the aisle and wide body aircraft. 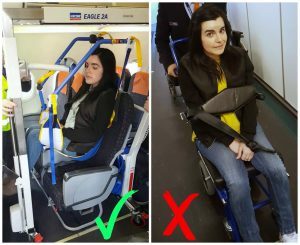 The Eagle2Lifter eliminates the need for multiple manual handling transfers as it transfers a passenger direct from their wheelchair to aircraft seat in a safe, respectful and dignified manner. The Eagle2Lifter also provides the service provider a “Choice” of transfer technique when presented with a passenger in excess of 100Kgs or 220Lbs, this is a major Health & Safety problem for the provider! The Eagle2Lifter can extend in length to accommodate for access to economy, premium economy, business class and some first class. The Eagle2Lifter can lift passengers over fixed armrests. The Eagle 3 Passenger Lifter is smaller in design and suitable regional commuter jets with either 2 or 3 seats each side of the aisle and requires the armrest to be raised. 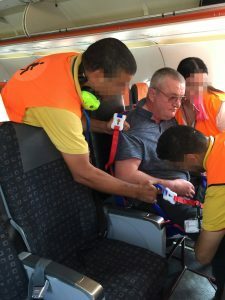 The Eagle3Lifter eliminates the need for multiple manual handling transfers as it transfers a passenger direct from their wheelchair to aircraft seat in a safe, respectful and dignified manner. The Eagle3Lifter also provides the service provider a “Choice” of transfer technique when presented with a passenger in excess of 100Kgs or 220Lbs, this is a major Health & Safety problem for the provider! 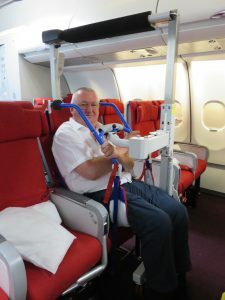 The Eagle3Lifter can extend in length to accommodate for access to economy, premium economy, business class but does require armrests to be raised as it does not lift high enough to clear fixed armrest. 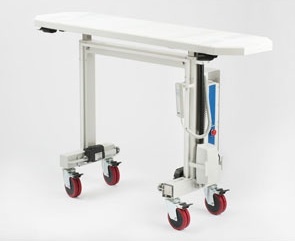 The Hawk Stretcher Trolley is designed to remove the risks for passenger, staff or medical team during the difficult transfer process of a stretcher patient to and from an ambulance or aircraft when in the confine space of the aircraft cabin. 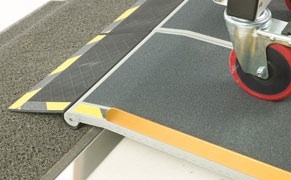 The Ramp is designed to provide a smooth traverse from aerobridge or ambulift to aircraft particularly as there is always a step. The Ramp was designed as an accessory to the Eagle2Lifter however airlines are now using them for aisle chairs and other trolleys. The strong & lightweight Ramp with its unique hinges reduces side rocking when the aerobridge is not perfectly parallel to the aircraft door. The articulated ends of the Ramp provide a smooth entry and exit even when traversing a step with the Eagle2Lifter or Hawk.